Brachioplasty, also known as 'arm lift' or ‘arm reduction’ surgery is a cosmetic procedure that reshapes the upper arms. The procedure reduces excess skin and fat resulting in better-proportioned and smoother skin on the upper arms. This type of arm lift surgery reduces localised pockets of fat while smoothing and tightening the underlying supportive upper arm tissue. 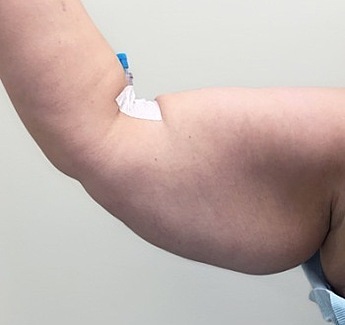 Brachioplasty is necessary where the patient desires a reduction of the size of the upper arm, and the skin is too loose for liposuction alone to reduce the size and achieve a good result. While liposuction removes fat effectively, it will not tighten the skin. Arm reduction surgery is a very popular cosmetic procedure for patients who have lost a lot of weight and feel self-conscious about wobbly and sagging upper arm skin. Brachioplasty surgery reshapes and reduces the loose skin of your upper arms, resulting in a more contoured and toned upper arm. People who seek out brachioplasty surgery have large amounts of excess, hanging upper arm skin. This can be a result of losing weight through diet, exercise or Bariatric surgery. In some cases this can be due to genetic inheritance or ageing. This loose upper arm skin can impact clothing choices and cause embarrassment. It is often called ‘tuck shop lady arms’ or ‘bat wings’. It is important to note that brachioplasty surgery is a personalised cosmetic procedure that may not be suitable for everyone. Your Cosmetic Surgeon will assess your general health and condition before planning the best treatment for you. How is brachioplasty surgery performed? Brachioplasty arm surgery is performed a Cosmetic Surgeon under a general anaesthetic. It can be performed as a day or overnight stay surgery and takes between 2 to 3 hours to complete. In many cases, the arm reduction surgery is done in combination with liposuction in an effort to further empty the loose skin of any fat. This allows the Cosmetic Surgeon to only remove skin while preserving all of the important structures in the patient's arms or legs such as nerves, blood vessels and lymphatics. After arm reduction surgery, most patients wear a compression garment for up to 6 weeks after the procedure. This compression gives vital support to the newly tightened upper arm skin upper arm and helps to result in a cosmetically pleasing result. It is important to note that most patients will feel uncomfortable for a few days. Almost every surgery has this side effect. After a few days, most patients experience no significant pain or discomfort. You will need to keep the incision dry and clean and regularly dress the incisions. While most arm reduction surgery patients return to work after 1 or 2 weeks, if your work is physically demanding it may take a little longer. Your Cosmetic Surgeon will advise you on how much time you need to take off work. 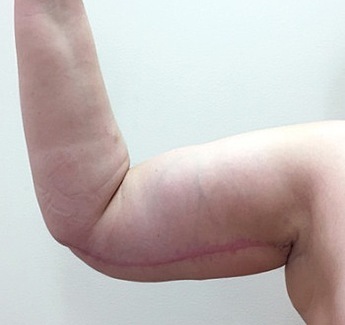 After brachioplasty surgery, it is important to avoid heavy lifting for at least 6 weeks. While most patients are comfortable to drive at 1 to 2 weeks it is important to avoid vigorous movements while driving. Are there any risks or complications with brachioplasty surgery? Extensive visible and prominent scarring that may be thickened, widened or uneven pattern including keloids and hypertrophic scars. These scars may form over healed incisions and may be annoying, itchy, and unsightly. While they are not a threat to your health, they can restrict the clothing you want to wear. Brachioplasty surgery treats a loss in skin elasticity and removes excess fat deposits between the underarm and elbow. The results of brachioplasty are long lasting. Skin loses elasticity and becomes saggy due to ageing or dramatic weight loss. Excessive fat deposits are those that cannot be eliminated through diet and exercise alone. After brachioplasty surgery, it is important to keep the incision dry and clean, as well as dress the incisions regularly. You must refrain from taking part in any physical activities following surgery for the period of time recommended by your Cosmetic Surgeon. Most people who have had brachioplasty surgery can return to work after 1 week. Recovery takes between 2 to 6 weeks. After brachioplasty surgery, you will need to wear a compression garment for up to 3 weeks. Compression garments assist in the healing process, help with post-operative swelling and reduces the possibility of fluid build-up. The benefits of brachioplasty surgery include: reducing bulky fat in the upper arms, creating a better contoured arm shape, removing loose underarm skin, and allowing clothes to fit better. Before you choose a Cosmetic Surgeon for your brachioplasty surgery, we suggest you make a few consultation appointments from your shortlist. During the consultation, your Cosmetic Surgeon will ask you questions about your current health situation including current medications, allergies and any past or current medical treatments. They will also ask you about the desired physical outcomes of your surgery. During the consultation the Cosmetic Surgeon will also examine your arms and take measurements, discuss the recovery process and advise you of any risks and potential complications of the surgery. You can find the best Australian Cosmetic Surgeons who specialise in brachioplasty surgery here. So you can make an informed decision, your elected Cosmetic Surgeon will discuss the possible risks associated with brachioplasty. Although the majority of patients do not experience these complications, it's important to understand how they can be managed in the event that they occur. I have always been a yoyo dieter, lose weight then put it back on, plus more. I finally had enough so I had a sleeve gastrectomy. Having successfully lost 50kg, I felt great except for my flappy arms and saggy breasts. My Bariatric Surgeon recommended Dr Ellis Choy as the “Go to Man” for my body contouring procedures. Despite my specialist recommendation, I also did a lot of research about Plastic Surgeons and Dr Choy came up top of the list every time. So I finally got the courage to contact Zilver Lining and made an appointment with Dr Choy. On my first consultation he made me feel very comfortable and put me at ease, he answered all my questions and showed me what I would look like after surgery. He was definitely the one for me. A breast reduction and arm lift were booked in. On the day of surgery, I was not a bit scared or nervous, Dr Choy and his team were very professional and reassuring. After I woke up my breasts didn't hurt at all but my arms were quite sore but nothing like I was expecting. I am now three months post surgery, everything has healed and my scars are very neat and looking great. I have fabulous breasts and skinny arms thanks to Dr Choy. For the first time in my life I love my body. No words could express my heartfelt thanks for the amazing works that Dr Choy has done for me. I’m now more in tune with myself and more confident in how I look & feel. I highly recommend Dr Ellis Choy and his team at Zilver Lining to anyone considering plastic surgery procedures.